I was looking through Pricematerz.com this week to see what produce I could get for great prices, and what do I see? Oodles of sale prices for chips, frozen pizza, and crackers. It must be Super Bowl Week. I’d forgotten all about it. For us right now it’s Blizzard Week, and we are in preparation for Youth Rally Weekend (where our church hosts 120+ teens for a fun and spiritually encouraging weekend). Therefore, I’m very much out of football mode. This is not such a shocker, since I’m always out of football mode and don’t even know who’s playing this weekend. Denver? And some other team? Forgive me. 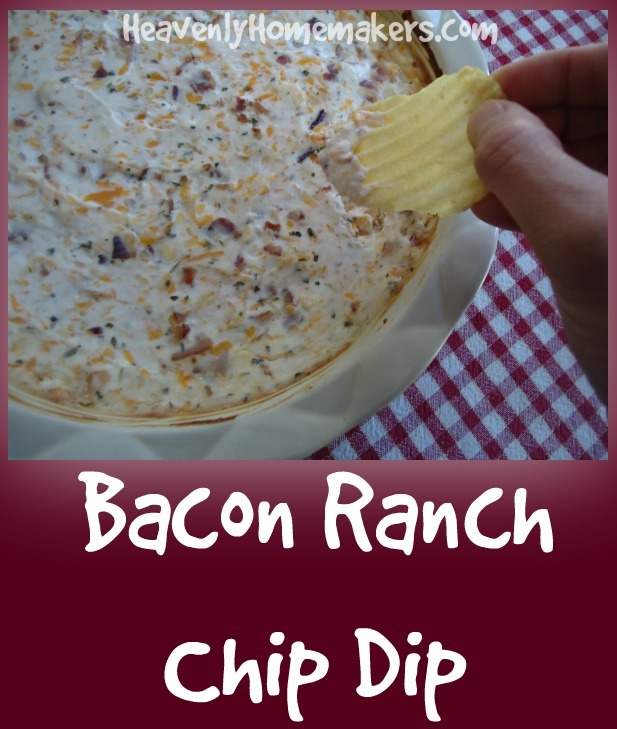 Now that I’m (only barely) caught up on what most Americans are thinking about this week, I’ve decided to share a new chip dip recipe in case you want to make this for your Super Bowl party. It includes bacon, sour cream, cream cheese, ranch dressing mix, and shredded cheese – so you know that means it is delicious. Since the recipe is coming from me – so you know that means it is easy. Our family tested it with corn chips, potato chips, and baked tortilla chips. We all preferred a different chip – which basically means that anything goes. Why do we have so many chips on hand? Oh my goodness, you do not want to see my stash of chips right now. It has just a little something to do with my preparations for Youth Rally Weekend where somewhere between 15-20 teenage boys will be staying at our house from Friday-Sunday. They’ll eat their meals at the church building, but it’s so weird that they are all hungry again when they come back here for the night. It’s like they’re normal or something. 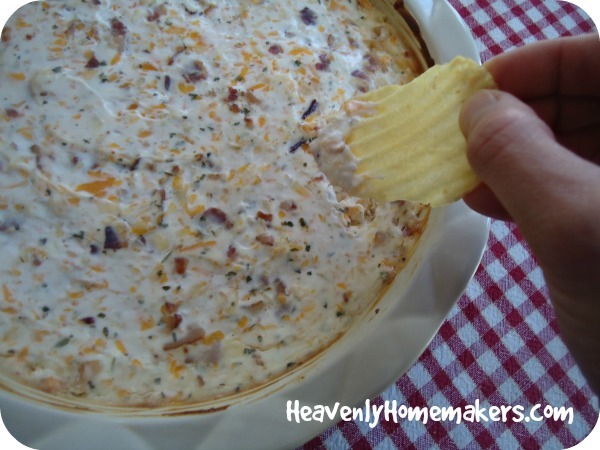 For this dip recipe, you’ll need this Homemade Ranch Dressing Mix recipe. Make it by the jar-full because that mix is what makes the world go ’round. Cut bacon into ½-inch strips. Cook the bacon to your liking, then drain. Stir cooked bacon into a bowl with all other ingredients. Spread mixture into a 2-quart baking dish. Bake in a 400° oven for 20-25 minutes or until dip is bubbly and hot. Serve with corn chips, potato chips, or baked tortilla chips. Are you in Super Bowl Week mode? Or Blizzard Week mode? Or Something Else Week mode? Or all/none/some of the above? I’m in Super Bowl mode this weekend because my Carolina Panthers are the team playing the Denver Broncos. Go Panthers!!!! Any other year I would be all about the food! ???? Tortilla, thanks for asking. :) We also decided yesterday that we could plop this on top a baked potato and enjoy our life very much. Ok, Laura, that looks fabulous, but your recipe says it serves 10…is that 10 “normal’ sevings, or 10 teenage boy servings? We, too, have hungry teenagers eating us out of house and home! I love your blog…I can totally relate! it’s plain crazy week at our house! Getting ready to move into house that is not done being renovated, just had a baby, trying to start schooling again, keeping up with the other7 children, and 4 birthdays this month!!!! I know these recipes will come in handy with my “not quite done” kitchen. Thank you, Laura, for your help, encouragement, and inspiration. Had this tonight for the game, was very good, but a little too salty.